Emails reach their destination within minutes. That is why they are so useful for personal and business correspondence. If you need to send someone a text document, you can attach it to email as an attachment or copy the entire document text to the clipboard and paste it into the form for sending the letter. Note that software that is installed on the recipient's computer may differ from yours. Even the same program, for example Microsoft Word has many versions. If the recipient of your letter is an outdated version of the program or, on the contrary, much newer than you, a text document that you create, the recipient simply won't open or opens incorrectly. To avoid this, specify in advance what format it is better to send the document. Use, if necessary, conversion programmes, which will help you to translate a document in the format required by the recipient. For example, to convert any text to PDF format, which is very often used when sending electronic documents, you can use a free program PDF24 Editor, which can be downloaded from here: http://en.pdf24.org/. If you don't want or can't install on a new computer program, use any free online service. For example, http://convertfileonline.com/. Open your box directly on the website of the postal service or run the client program, which you usually use. Go to "Write a letter". Enter the email address of the recipient (recipients). Set the subject line is logical to use the name of sent text. Click on the "Attach file" and browse your computer to locate the text document that you want to send. Wait until the file has loaded. If necessary, add more documents. The text of the letter can make a small explanatory entry. For example: "In response to your request send you the current price list for our services in PDF format". If the text is small, you can just paste it into the form for sending the letter. To do this, open the document in the editor and select the option "Select all". In most editing software this can be done by pressing the key combination Ctrl+A. Copy selection to clipboard — use Ctrl+C or the context menu invoked by right mouse button. Place the cursor in the text input in the form of e-mail and press Ctrl+V or right-click the mouse and select the menu item "Paste". Use, if necessary, additional sending options e-mail delivery notification and read notification letters, notification letters via SMS, etc. the List of additional services is dependent on your mail service. How to use them, read the help system of your email service or client program. Click on the "Send" — the message will be sent to the address (es). View a list of sent emails you can in the "Sent" folder, unless otherwise provided by the settings of your service or email program. If necessary, you can repeat the sending of e-mail together with the attached text file (files) to the same addressee or to redirect it to another recipient. Investment in email limited. If you need to send a text document the size of which exceeds, for example, e-book, you can upload it to file storage of your mail service and send the recipient a link that he can download the file. These free storage offer its users many popular e-mail service. 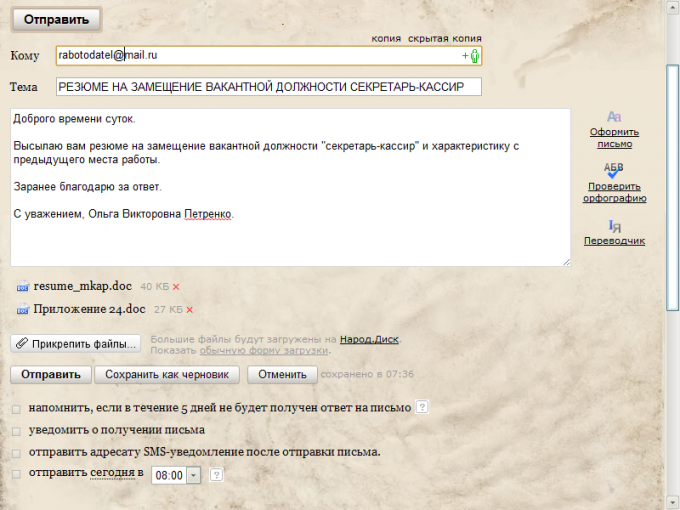 For example, Mail.ru and "Yandex".